This 14K yellow gold antique style engagement ring mounting is crafted with a deep octagonal shank that will hold a 7 x 5 emerald cut stone. 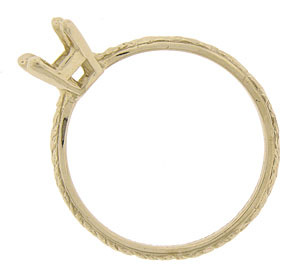 The band is decorated with a richly engraved organic design and measures 7.81 mm in width at the central shank. Size 6 3/4. 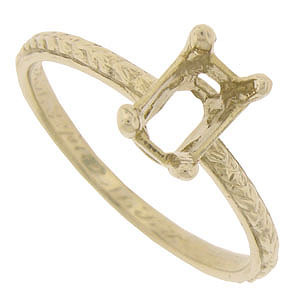 This elegant wedding ring mounting can be re-sized or reordered in other sizes. Also available in 18K yellow or white gold and platinum. Actual cost depends on current market value of the precious metal used.